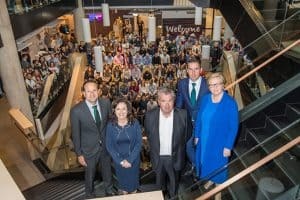 An Taoiseach Leo Varadkar and Tánaiste Frances Fitzgerald officially opened LinkedIn’s new 17,650 sq m Europe, Middle East and Africa (EMEA) HQ at Wilton Place in Dublin today. The new building is the first that LinkedIn has built outside the USA, and is the result of an €85 million investment. The development was undertaken in order to meet the needs of LinkedIn’s growing workforce in Ireland, which has increased from three employees to 1,200 in just seven years. 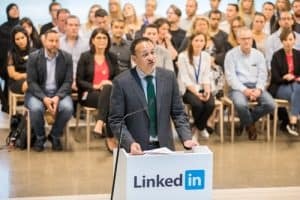 Speaking at opening ceremony, an Taoiseach Leo Varadkar TD said: “This new EMEA HQ is the first such building outside the United States for LinkedIn and is a strong endorsement of the Government’s economic and job creation strategy because it reaffirms that Ireland is the perfect location for investment. “When LinkedIn first came to Ireland in 2010 we were in the middle of one of our darkest periods economically. But today, thanks to the sacrifices of the Irish people and the policies pursued by the Government, our economy has recovered, and we are now facing the future with renewed confidence. Over the last seven years, the LinkedIn workforce here in Dublin has grown from just three staff members to 1,200. Indeed, LinkedIn’s belief in Ireland as a location for investment has contributed to our economic recovery. Linkedin’s Dublin operation serves the entire EMEA region supporting customers and members across two continents. The workforce includes people from 55 nations, in functions including sales, marketing, customer service, finance, analytics and engineering. LinkedIn is continuing to hire in Dublin, with more than 70 jobs currently advertised. 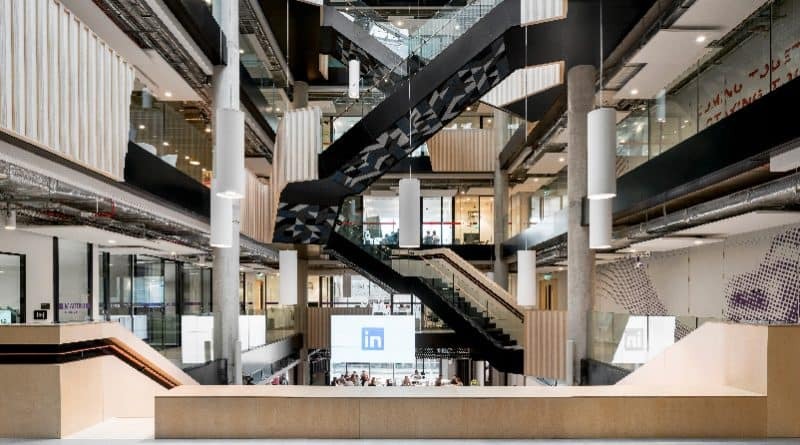 The five-storey building has been designed to create opportunities for LinkedIn staff and visitors to socialise, collaborate and exchange ideas. Some of the fantastic facilities include a music studio, a high-end gym and fitness studio, a restaurant, coffee bar, an expansive roof terrace, and a games room. A number of Irish companies were involved in the building works, and at the height of the construction, which was completed in two years, the project saw 360 workers on site every day.